Tom Perrotta's thirty-ish parents of young children are a varied and surprising bunch. There's Todd, the handsome stay-at-home dad dubbed "The Prom King" by the moms of the playground; Sarah, a lapsed feminist with a bisexual past, who seems to have stumbled into a traditional marriage; Richard, Sarah's husband, who has found himself more and more involved with a fantasy life on the internet than with the flesh and blood in his own house; and Mary Ann, who thinks she has it all figured out, down to scheduling a weekly roll in the hay with her husband, every Tuesday at 9pm. They all raise their kids in the kind of sleepy American suburb where nothing ever seems to happen-at least until one eventful summer, when a convicted child molester moves back to town, and two restless parents begin an affair that goes further than either of them could have imagined. 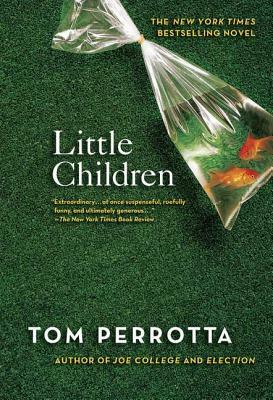 Unexpectedly suspenseful, but written with all the fluency and dark humor of Perrotta's previous novels, Little Children exposes the adult dramas unfolding amidst the swingsets and slides of an ordinary American playground. Tom Perrotta is the author of several works of fiction: Bad Haircut, The Wishbones, Election, and the New York Times bestselling Joe College and Little Children. Election was made into the acclaimed 1999 movie directed by Alexander Payne and starring Matthew Broderick and Reese Witherspoon. Little Children was released as a movie directed by Todd Field and starring Kate Winslet and Jennifer Connelly in 2006, and for which Perrotta received Golden Globe and Academy Award nominations for best screenplay. He lives outside of Boston, Massachusetts.